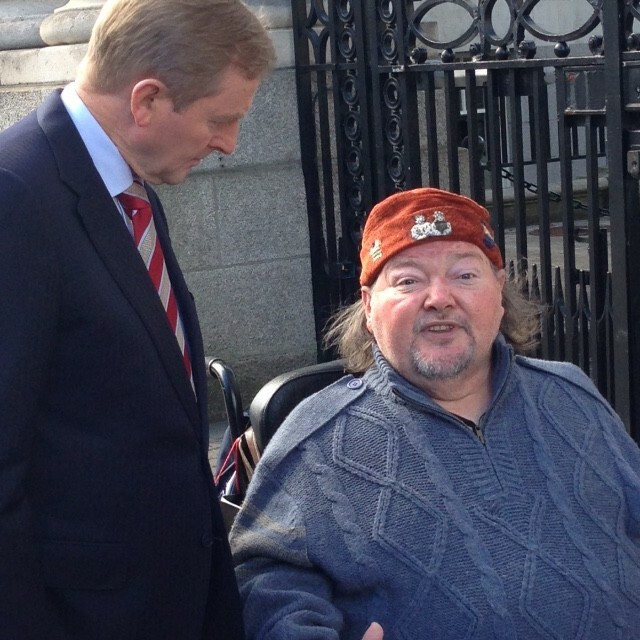 Shortly after 10 am this morning, the Minister for Finance, Michael Noonan, and his staff were the first to encounter Martin Naughton and other disability movement leaders, who were traversing the entrance to Government Buildings with a serious sense of intent. This brief moment signified the start of a planned 72-hour day and night action aiming to focus critical attention on the serious neglect of people with disabilities and their families, and the failure of the Government to implement long delayed human rights and equality measures, as well as the ratification of the United Nations Convention on the Rights of Persons with Disabilities (UNCRPD). A sense of build-up was in the air; the assembly grew, along with public and media interest, and a campaign press conference was held at midday. The Center for Independent Living (CIL), Inclusion Ireland, and Áiseanna Tacaíochta (ÁT) were prominent, and provided speakers and perspectives that were well covered by national print, radio and television journalists. With media present, Donal Toolan took the opportunity to report the sad news that that Joe T Mooney – a key leader in the disability movement in Ireland for over 30 years – had died during the night. He also stated that the decision was taken that the campaign should continue in honour of Joe T, who had intended to take part, and assured the disability community that old comrades will remain steadfast in the fight for not only disability rights, but for human rights and equality. By being present in such a public and dedicated manner, the campaign group was seeking to engage in discussions with the Government. Ministers Michael Noonan and Brendan Howlin were the initial targets in relation to Budget 2016 and the implementation of long-term plans linking finance and strategic policy commitments. Surprisingly however, at around 1.30 pm, the Taoiseach, Enda Kenny, arrived unannounced. He met with key leaders on the pavement and, after some discussions, made a commitment to arrange and personally attend a cross-departmental meeting with the leading members of the campaign. It was agreed that the forthcoming meeting would consider both the substance of the campaign agenda for change, and examine specific details on the breakdown of the €300 million being sought to redress cuts and improve independent life choices for people with disabilities. A lot had happened in a few hours. The initial energy and great sense of purpose was tempered with sadness at the loss of Joe T, but was somehow elevated again in the untypical September sunshine. Uncertain as to whether the issues of disability and the developing campaign would be formally included on the agenda of the scheduled Cabinet meeting tomorrow, Martin Naughton, Director of ÁT, encouraged an enlarged assembly to gather outside Government Buildings on Merrion Street tomorrow from 10 am onwards, while another press conference will take place on site at 12 midday. We also invite you to engage with the campaign on social media, to make links with local, regional and national media in order to help us to sustain the important public debate and political campaign that was ignited here today. For more information, please contact Martin Naughton (086 720 7196).